Megabus keeps growing – 10 years now! 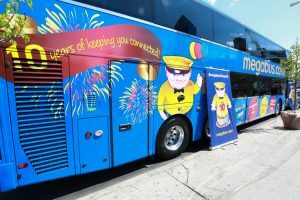 Megabus is having a big anniversary – ten years serving the Midwest and the east coast with low-cost inter-city express bus service. Frankly, I love Megabus. When I heard about the $1 fare ten years ago, I couldn’t wait to try it out. Hard to believe they could afford to do that, but yes, for $1 I became one of the first riders back then. I happily gave up flying and driving between Cleveland and Chicago, a trip I made with regularity. At first, I was one of four or five people on the buses. But the service was excellent, the drivers professional and courteous, and I soon began looking forward to relaxing into the refurbished seats inside the bright blue buses adorned with the figure of the little round guy in a yellow cap. After I moved to Chicago, I kept riding the Megabus back to Cleveland. One of the nicest aspects of riding the Megabus is the fact that I arrive at my destination feeling rested and relaxed instead of stressed out from flying or exhausted from driving. I bring my lunch and drink; they have one half-hour rest stop when you can purchase food and drink and one brief stop to pick up and drop off in Toledo. I’ve watched the service grow in popularity, add electric outlets and wi-fi access, and introduce a small number of higher-priced reserved seats. Now they’re standing out for their contribution to the well-being of our planet. This earth month megabus.com, a subsidiary of Coach USA, in celebration of its ten years of sustainable travel in the United States, has partnered with the Arbor Day Foundation to plant 10,000 trees along megabus.com routes and on college campuses throughout the country over the next year. The brand kicked off the celebration in New York City with award-winning actor, Skylar Astin who shared the news about this eco-friendly travel option. He helped christen their 10th anniversary bus, featuring the brand’s beloved mascot, Chuck, at one of their Manhattan stops. As part of its effort to reduce environmental impact, double decker busses are outfitted with a Green Roads system that gives drivers real time information and feedback to drive safer, it also assists with reducing fuel consumption and carbon. With megabus.com and fares from $1 (plus a reservation fee), the cost of travel is no longer an issue. To purchase your ticket or learn more about available routes visit megabus.com. For more information and the latest news and travel deals, follow megabus.com on Twitter, Facebook and Instagram.